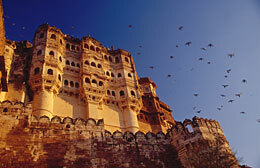 Regarded purely as a piece of real estate, Jodhpur's Mehrangarh Fort has location, location, location. Its rounded buttresses rise like the sides of a rocket, straight out of a singular hill of solid rock. To say this palace comes with unobstructed views would be an understatement: in its shadow, the barren beginnings of the Thar Desert stretch for as far as the eye will allow. Most old fortifications are monuments to some feudal despot's hatred, greed, arrogance or ambition. But the Mehrangarh Fort is testament to the foresight and good taste of the current Maharaja, Gaj Singh II, who has helped to make it a new symbol for the Rajasthani city best known for the riding breeches that the English once discovered there. When he vowed to make his fort a "world class" attraction back in 1972, the man wasn't whistling through his curled mustache. For starters, the fort's carved courtyards and atmospheric inner sanctums are so clean they seem freshly scoured by desert sands. Instead of touts and shoeshine boys, a select group of standout musicians and craftsmen breathe life into well-planned exhibits of jewels and howdahs (the carriages mounted on the backs of elephants). Headphones offer audio tours that actually teach you things you'd like to know. The shop, featuring porcelain, scarves, books and games, could be an annex to New York City's Museum of Modern Art. High above the tumult, the fort's most spectacular vista may be a glimpse of an India that is at once accessible and serene, properly respectful of the past and perfectly packaged. But, just in case it all seems too orderly, the cubistic warren of Jodhpur's Blue City, a casbah mirroring the sky, is five kilometers of winding road away, packed with pastel-colored lanes offering everything India has ever made or barteredexcept those famous riding breeches.